The weather is strange here in Kansas today. The high temp is headed towards 80 degrees thanks to abundant southern breezes. Still, in spite of this taste of spring, many of my friends are feeling under the weather and in need of comfort. 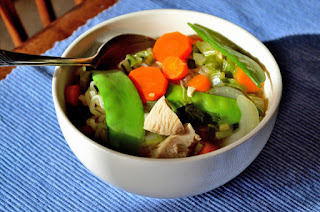 This Asian Chicken Noodle Soup recipe has become my go-to meal for days I’m not feeling well, both in body and spirit. The inspiration for this dish came from two places. One was a terrific vegetable soup I often ordered from my favorite New Hampshire Chinese restaurant years ago. The other was Nigella Lawson’s Noodle Soup for Needy People recipe, which I posted about a few years ago. 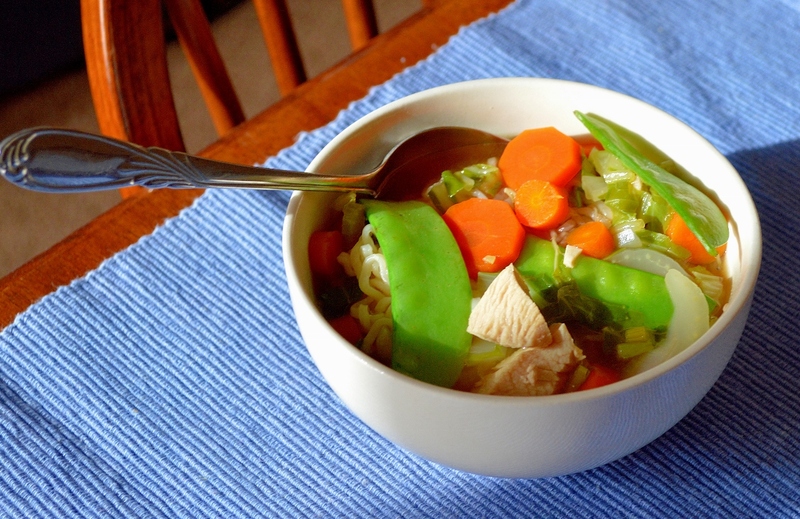 This soup is full of healthy ingredients. Feel free to experiment with your favorite vegetables to make it fit your tastes. It is great for using leftover chicken. If you don’t have any, you can use a rotisserie chicken from the grocery store, or poach 2 boneless chicken breasts in the chicken broth before making the rest of the soup. Also, I use those inexpensive packets of Raman noodles, but you can use any type of noodle you like. Asian Chicken Noodle Soup gives comfort, both when you’re not feeling the best and when you’re just in need of a warm, soothing meal. Pour the chicken broth into a large pot. Bring to a boil and then add the carrots, celery, onion, and garlic. Turn the heat to a simmer and cook until the carrots are tender, about 20 minutes. While the bok choy cooks, prepare the Raman noodles according to the package directions, leaving out the flavoring packet. Once cooked, divide the noodles between the serving bowls, and add some snow peas and bean sprouts to each dish. Ladle the hot soup into each bowl over the noodles, peas and sprouts. Garnish with green onions and serve. This sounds so good. I am on to ginger in everything. I never knew how much it added to some dishes. Thanks, Lita. I love ginger, too. I've been putting in into everything lately. I comes in second only to cinnamon.